Put the first nine ingredients in a large bowl, then add two-thirds of the duck fat. Salt and pepper to taste, then work the preparation with your hands until obtaining a uniform mixture. Set aside. Heat the rest of the duck fat in a large shallow pan with a lid and sauté the chopped carrot for 2 minutes. Add a third of the ground duck mixture and cook for 5-6 minutes, breaking up any clumps with a wooden spoon. Add the diced tomatoes, tomato sauce, oregano, parsley, and salt and pepper to taste. Mix and continue cooking over medium heat. Meanwhile, with your hands, shape the rest of the ground duck mixture into medium-sized balls and place them in the Bolognese sauce. Soak your hands in cold water occasionally to prevent the mixture from sticking to them. Turn the meatballs gently, covering them with the sauce. Cook over low heat for about 40 minutes or until done. 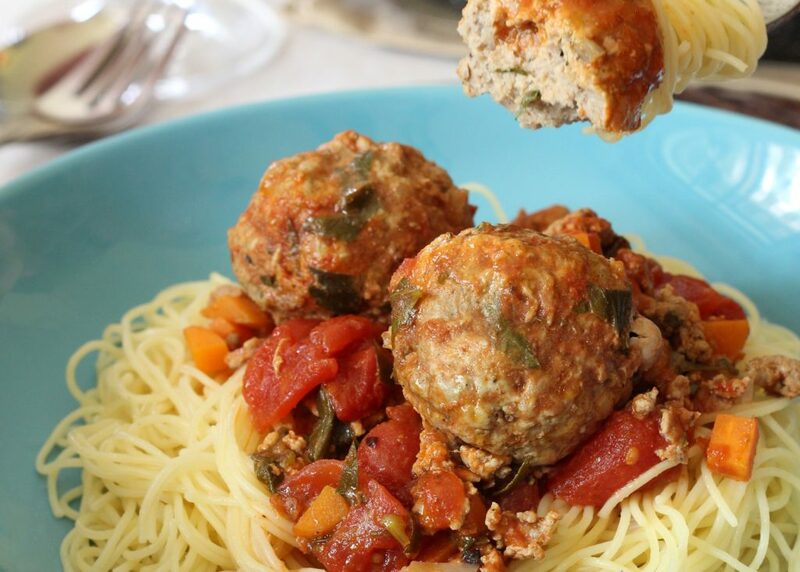 Serve the duck Bolognese sauce with meatballs on long pasta such as vermicelli, capellini, angel hair, etc.